One of the most impressively preserved medieval towns in all of Europe, Rhodes Old Town has to be seen to be believed. Given the violent history of human beings, how did we allow such a magnificent feat of architecture to go unscathed? 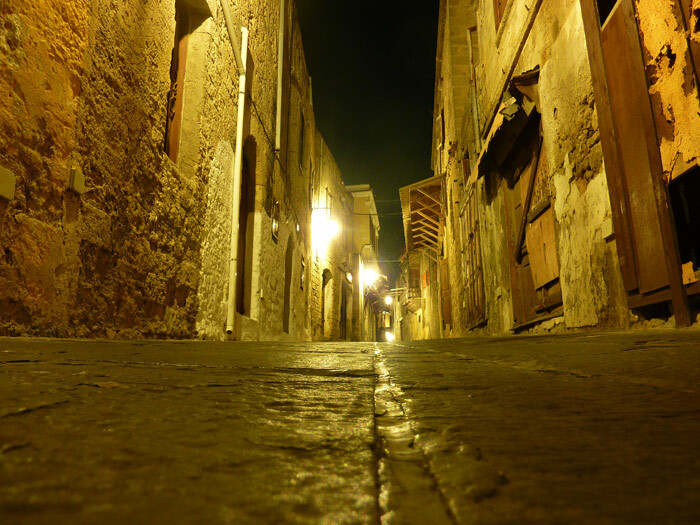 Wandering Rhodes Old Town is akin to being transported back into medieval times – a walled city of churches, palaces, town squares and fountains, all interconnected by uneven narrow cobblestone streets. I feel incredibly under-dressed in shorts and sandals – a Maid Marion outfit would be more appropriate in these surrounds. You would expect this to be a museum with roped off exhibits and ugly headphone sets available for rental, right? Very wrong. This is a vibrant bustling neighbourhood of shops, museums, restaurants, bars, villas and over 6,000 inhabitants. That’s right – 6,000 permanent inhabitants, residing in this network of criss-crossing streets, a village large enough to get lost in. It is an unbelievable site, and outside of several main streets, not as touristy as one would expect. I don’t think its inhabitants are even aware that they reside in the same buildings as the Knights of St John. At various points in history, Rhodes was occupied by the Knights Hospitallers (who created the fortification that is now the Old Town), the Ottomans (who raised mosques and baths) and the Italians (who destroyed much of the Ottoman structures and reconstructed much of what was from the Knights period). So this would explain the Italian/Ottoman/medieval influence on this incredibly rich historic land. It’s not surprising then that UNESCO declared it a World Heritage site. Old Town is best explored by simply wandering around the cobblestone streets, and happening upon its exotic relics from times gone by. The imposing Palace of the Grandmaster, takes a full afternoon to circumnavigate, with displays of 1st Century mosaics, ancient sculptures and medieval artefacts within its fortress walls. It’s a cool place to pass a hot afternoon. The Archaeological Museum of Rhodes, housed in the impressive Knights Hospital, is also well worth a visit for its collections from Hellenistic and Roman times. I finally tear myself away from the Old Town, as Rhodes Island has so much to offer. The island is large by Greek standards – Rhodes Town to Lindos alone is a long 45 kilometres – so a car is an absolute must. A trip to Lindos needs a full day. Not only are there spectacular views of the harbour to take in from the heights of the Acropolis of Lindos, but Lindos Town has a wealth of landmarks, temples and ancient structures to discover in its labyrinthine lanes. Its schizophrenic architecture is a reflection of Byzantine, Gothic and Middle Eastern presence. At night, the cafes and bars come to life in the intimate surrounds. There is no shortage of beautiful beaches around the island, the more notable ones being Anthony Quinn beach (so named when the star filmed “The Guns of Navarone” here), Lindos and Vliha. There are also very decent beaches in Rhodes town itself, which are a god-send after a hot day of sightseeing. Back in Old Town, I am patting myself on the back for booking a pension within the castle walls. It’s one thing to visit Old Town for a couple of hours, and a completely different experience to stay there. It takes on a unique feel at different times of the day. You can see the Old Town in the morning before the shops are open, wander through the quiet cobblestone lanes, enjoy fresh bread from the bakery and watch the locals slowly starting their day. Or sit in the shade during the hot afternoons, cooling down with a double scoop of gelati. Dusk brings freshly scrubbed up tourists, healthy and glowing from a day spent at the beach, lazily wandering the shops looking for a unique memento to take home. After midnight, the bars are in full swing, with throngs of people congregated in the lanes enjoying the warm summer night. The venues are all alfresco, taking advantage of the ominous mood created by the surrounding castle walls and iron doors. Some of the buildings are deteriorating and in need of tender loving care, but it’s just the slightest bit of wear, a door that’s come off of its hinge, peeling paint off a window. This only adds to the realness of the Old Town, to its authenticity. If every edifice was perfectly maintained, and occupied by a shop, it would seem too polished, tidy, touristy. Instead as you wander away from the busyness and din of the main streets and into alleyways that are all you own, the streets take on their original feel. You can almost hear the echo of knights on horses clip-clopping down the cobblestones.